MXN$108,570.92 per month, before taxes. 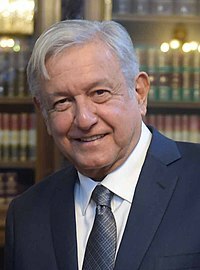 The President of Mexico (Spanish: Presidente de México), officially known as the President of the United Mexican States (Spanish: Presidente de los Estados Unidos Mexicanos), is the head of state and government of Mexico. Under the Constitution, the president is also the Supreme Commander of the Mexican armed forces. The current President is Andrés Manuel López Obrador, who took office on December 1, 2018. Chapter III of Title III of the Constitution deals with the executive branch of government and sets forth the powers of the president, as well as the qualifications for the office. He is vested with the "supreme executive power of the Union". Not be a secretary of state or under-secretary of state, attorney general, governor of a State, or head of the government of Mexico City, unless "separated from the post" (resigned or been granted permanent leave of absence) at least six months prior to the election. The ban on any sort of presidential re-election dates back to the aftermath of the Porfiriato and the end of the Mexican Revolution. It is so entrenched in Mexican politics that it has remained in place even as it was relaxed for other offices. In 2014, the constitution was amended to allow Deputies and Senators to run for a second consecutive term. Previously, Deputies and Senators were barred from successive re-election. However, the president remained barred from re-election, even if it is nonsuccessive. The presidential term was set at four years from 1821 until 1904, when President Porfirio Díaz extended it to six years for the first time in Mexico's history, and then again from 1917 to 1928 after a new constitution reversed the change made by Diaz in 1904. Finally, the presidential term was set at six years in 1928 and has remained unchanged since then. The president is elected by direct, popular, universal suffrage. Whoever wins a simple plurality of the national vote is elected; there is no runoff election. Former President Felipe Calderón won with 36.38% of the votes in the 2006 general election, finishing only 0.56 percent above his nearest rival, Andrés Manuel López Obrador (who contested the official results). Former President Vicente Fox was elected with a plurality of 43% of the popular vote, Ernesto Zedillo won 48% of the vote, and his predecessor Carlos Salinas won with a majority of 50%. The most recent former president, Enrique Peña Nieto won 38% of the popular vote. The current President, Andrés Manuel López Obrador, was elected in 2018 with a modern-era record of 53% share of the popular vote. The PRI enacted a strict internal discipline and government presence in the country, and electoral fraud became common. After the country regained its peace, this pattern of fraud continued, with the opposition losing every election until the later part of the 20th century. The first presidential election broadly considered legitimate was the one held in 1994, when the PRI's Ernesto Zedillo took office, and in his term several reforms were enacted to ensure fairness and transparency in elections. Partly as a consequence of these reforms, the 1997 federal congressional election saw the first opposition Chamber of Deputies ever, and the 2000 elections saw Vicente Fox of a PAN/PVEM alliance become the first opposition candidate to win an election since 1911. This historical defeat was accepted on election night by the PRI in the voice of President Zedillo; while this calmed fears of violence, it also fueled questions about the role of the president in the electoral process and to whom the responsibility of conceding defeat should fall in a democratic election. At any time, opt for a coalition government with one or more of the political parties represented in Congress. The others expressly conferred by this Constitution. The Mexican Presidential sash has the colors of the Mexican flag in three bands of equal width, with green on top, white in the center, and red on the bottom, worn from right shoulder to left waist; it also includes the National Seal, in gold thread, to be worn chest-high. In November 2018, a reform was made on Article 34 reordering the colors of the sash. A new sash was made putting the colors of the sash back to the previous order that was used from 1924 through 2009. In swearing-in ceremonies, the outgoing President turns in the sash to the current President of the Chamber of Deputies, who in turn gives it to the new President after the latter has sworn the oath of office. The sash is the symbol of the Executive Federal Power, and may only be worn by the current President. According to Article 35 of the Law on the National Arms, Flag, and Anthem, the President must wear the sash at the swearing-in ceremony, when he makes his annual State of the Union report to Congress, during the commemoration of the Grito de Dolores on September 15 of each year, and when he receives the diplomatic credentials of accredited foreign ambassadors and ministers. He is also expected to wear it "in those official ceremonies of greatest solemnity". The sash is worn from right shoulder to left hip, and should be worn underneath the coat. The only exception is during the swearing-in ceremony, when it is worn over the coat so that the out-going president may easily take the sash off and drape it over the incoming president (Article 36). Since the beginning of his term, the official residence of president Andrés Manuel López Obrador has been the National Palace, a building facing the Mexico City Zócalo. The President also has the use of Chapultepec Castle, formerly an Imperial palace of the Second Mexican Empire, and afterwards the official residence of Mexican Presidents until the Presidency of Lázaro Cárdenas in 1937. The National Palace is also the formal seat of the Executive Power, and had been the official seat of power in Mexico since early colonial times, until it was moved in 1937 to Los Pinos. The succession provisions have come into play only twice since the current constitution was enacted. In 1928, after the assassination of president-elect Álvaro Obregón, Congress appointed Emilio Portes Gil as Interim President; Portes Gil served in the position for 14 months while new elections were called. Pascual Ortiz Rubio was elected President in the special elections that followed in 1930, but he resigned in 1932. Abelardo L. Rodríguez was then appointed Interim President to fill out the remainder of Ortiz Rubio's term (under current law Rodríguez would be Substitute President, but at the time there was no distinction between Interim, Substitute, and Provisional Presidents). There are six living former presidents. The most recent former president to die was Miguel de la Madrid (1982–1988), on 1 April 2012. Former presidents of Mexico continue to carry the title "President" until death but are rarely referred by it; they are commonly called ex-Presidents. They are also given protection by the Estado Mayor Presidencial. Prior to 2018, former presidents also received a lifetime pension, though they could refuse it, as Ernesto Zedillo did. However, the pensions were abolished and terminated in 2018. Contrary to what happens in many other countries, former presidents of Mexico do not continue to be important national figures once out of office, and usually lead a discreet life. This is partly because they do not want to interfere with the government of the new president and partly because they may not have a good public image. This tradition can be traced back to the presidency of Lázaro Cárdenas. Former president Plutarco Elías Calles had personally selected Cárdenas as his successor, and had hoped to control things from behind the scenes as he had for the previous five years. However, when Cárdenas showed he was going to rule in fact as well as in name, Calles publicly criticized him, prompting Cárdenas to have Calles escorted out of the country by military police. Cárdenas himself remained silent on the policies of his successor Manuel Ávila Camacho, establishing a tradition that former presidents do not interfere with their successors. For example, Ernesto Zedillo holds important offices in the United Nations and in the private sector, but outside of Mexico. It is speculated he lives in a self-imposed exile to avoid the hatred of some of his fellow members of the PRI for having acknowledged the PRI's defeat in the 2000 presidential election. Carlos Salinas also lived in a self-imposed exile in Ireland, but returned to Mexico. He campaigned intensely to have his brother, Raúl Salinas, freed after he was jailed in the early days of Zedillo's term, accused of drug trafficking and planning the assassination of José Francisco Ruiz Massieu. Carlos Salinas also wrote a book on neo-liberal Mexico, secured a position with the Dow Jones Company in the United States, and worked as a professor at several prestigious universities in that country. Felipe Calderón was given a contract to work as a professor for Harvard University in 2013, but he returned to Mexico in 2014. It was rumored that he would look after the then newly created Humanist Party; this fact was eventually denied by his wife. Along with Felipe Calderón, three other surviving former presidents (Luis Echeverría, Vicente Fox, and Enrique Peña Nieto) still live in Mexico. On June 30, 2006, Echeverría was placed under house arrest under charges of genocide for his role as Secretary of the Interior during the 1968 Tlatelolco massacre. The house arrest was lifted in 2009. ^ At an exchange rate of 17.95 pesos to one dollar, approximately $11,619 per month; the salary after taxes is listed as MXN$147,651.22 (US$11,391.99). "Portal de Obligaciones de Transparencia". 16 October 2012. Retrieved 2 December 2012. ^ Article 80, Constitution of Mexico. "Constitución Política de los Estados Unidos Mexicanos" (PDF) (in Spanish). Cámara de Diputados. p. 55. Archived from the original (PDF) on 2 January 2013. Retrieved 22 September 2011. ^ "Enrique Pena Nieto wins Mexican presidential election". The Daily Telegraph (London). Retrieved 12 December 2012. ^ Buckman, Robert T. (2007). The World Today Series: Latin America 2007. Harpers Ferry, West Virginia: Stryker-Post Publications. ISBN 1-887985-84-0. ^ "About Us". Electoral Tribunal of the Federal Judicial Branch. Retrieved 20 July 2012. ^ El Debate (14 September 2018). "Oficial: Eliminan pensión de ex-presidentes" (in Spanish). Debate. Retrieved 2 December 2018. ^ "Felipe Calderón regresa a México para "supervisar" al Partido Humanista". SDP Noticias. Retrieved 7 July 2014. ^ "Felipe Calderón regresó a México, confirma su esposa". Proceso. Retrieved 10 July 2014. ^ "Echeverría, bajo prisión preventiva domiciliaria - El Universal - México". El Universal. Retrieved 19 September 2012. Lázaro Cárdenas del Río was a general in the Constitutionalist Army during the Mexican Revolution and a statesman who served as President of Mexico between 1934 and 1940. He is best known for nationalization of the oil industry in 1938 and the creation of Pemex, the government oil company. He also revived agrarian reform in Mexico, expropriating large landed estates and distributing land to small holders in collective holdings (ejidos). The Confederation of Mexican Workers is the largest confederation of labor unions in Mexico. For many years, it was one of the essential pillars of the Partido Revolucionario Institucional, which ruled Mexico for more than seventy years. However, the CTM began to lose influence within the PRI structure in the late 1980s, as technocrats increasingly held power within the party. Eventually, the union found itself forced to deal with a new party in power after the PRI lost the 2000 general election, an event that drastically reduced the CTM's influence in Mexican politics. The Head of Government wields executive power in Mexico City. The Head of Government serves a six-year term, running concurrently with that of the President of the Republic. Mexico City, or CDMX, is the seat of national executive, legislative, and judicial power, and is largely contiguous with the core of the sprawling Mexico City conurbation. The Mexican Office for Domestic Affairs is the public ministry concerned with the country's domestic affairs, the presenting of the president's bills to Congress, their publication and certain issues of national security. The country's principal intelligence agency, CISEN, is directly answerable to the Secretary of the Interior. The Secretary is a member of the President's Cabinet and is, given the constitutional implications of the post, the most important Cabinet Member. Additionally, in the absence of the President, the Secretary of Interior assumes the job of the President and so, in this matter, the Secretary is similar to a Vicepresident. The Office is practically equivalent to Ministries of the Interior in most other countries and is occasionally translated to English as Ministry, Secretariat or Department of the Interior. The Mexican general election of July 2, 2006, was one of the most hotly contested elections in Mexican history and as such, the results were controversial. According to the Federal Electoral Institute (IFE), the initial "Quick Count" determined the race was too close to call, and when the "Official Count" was complete, Felipe Calderón of the right-of-center National Action Party (PAN) had won by a difference of 243,934 votes. The runner-up, Andrés Manuel López Obrador of the left-of-center Coalition for the Good of All, immediately challenged the results and led massive marches, protests, and acts of civil resistance in Mexico City. On August 9, while protests continued to expand, a partial recount was undertaken by election officials after being ordered to do so by the country's Federal Electoral Tribunal. The tribunal ordered the recount of the polling stations that were ruled to have evidence of irregularities, which were about nine percent of the total. Manlio Fabio Beltrones Rivera is a Mexican economist and elected official, member of the Partido Revolucionario Institucional (PRI) party, and a federal deputy since September 1, 2012. He was the president of the Senate during its 2006-2007 session and was reelected to that position for the 2010-2011 term. He served as governor of Sonora from October 22, 1991 to September 12, 1997. He served two terms as federal deputy. He was the President of the Chamber of Deputies in 2004-2005. From 2015 to June 2016, he was the president of the Institutional Revolutionary Party. The Maximato was a period in the historical and political development of Mexico from 1928 to 1934. Named after former president Plutarco Elías Calles's sobriquet el Jefe Máximo, the Maximato was the period when Calles continued to exercise power, but did not hold the presidential office. The six-year period was the term that president-elect Alvaro Obregón would have served had he not been assassinated directly after the July 1928 elections. There needed to be some kind of political solution to the presidential succession crisis. Calles could not hold the presidency again, due to restrictions on re-election without an interval out of power, but he remained the dominant figure in Mexico.